Yes folks, apparently a glove compartment that could hold more than a pair of gloves was big news in 1932. I’m still looking for an issue in the seventies where they breathlessly announce the amazing new cup holders. 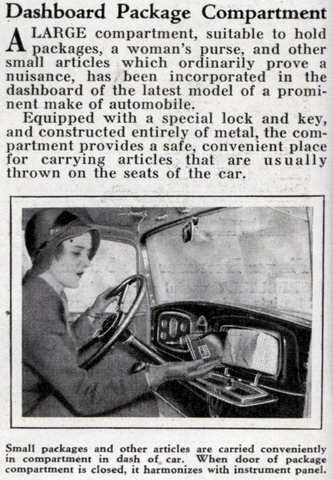 A LARGE compartment, suitable to hold packages, a woman’s purse, and other small articles which ordinarily prove a nuisance, has been incorporated in the dashboard of the latest model of a prominent make of automobile. Equipped with a special lock and key, and constructed entirely of metal, the compartment provides a safe, convenient place for carrying articles that are usually thrown on the seats of the car.